Lets talk about Spam babe! I asked 2 friends this simple question earlier today: ‘When someone mentions the word Spam to you, what comes to your mind?’The response from both was ‘Meat in a tin’ and ‘Food’. That word Spam has always meant food in a tin. Its famous the world over. Even more famous than Coca-cola in some places. 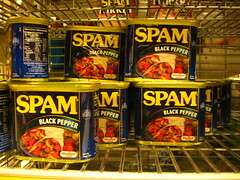 Remember the world-famous Monty Python quote: “we eat ham, and jam and Spam a lot.” Many a folk have grown up eating spam. Its celebrated the world over with several festivals or Spam Jams in the USA states of Hawaii, Texas, Oregon and some states in Europe. Spamaramas is another name for festivals in honour of this ubiqutous nutritional delicacy.Its cultural place has been cemented through the Monty Python musicals and films as well as the Spam Museum in Austin Texas. Napoleon famously said ‘An army can not march on an empty stomach’ (or something to that effect) and Spam has been the stomach-filler of choice for armies too. Were it not for the Spam enriched meals perhaps the Korean War may not have lasted as long as it did. Spam with rice became the staple fuel for the tummies of the warring parties. It is everywhere. In Israel, they even went as far as making a Kosher version of Spam.Every supermarket has stacks of tins carefully placed to catch our eyes and appetites for quick easy-to-make meals. I shall not debate the nutritional values. However, Spam’s importance in people’s diets can not be ignored. What made me blog about Spam is my increasing exasperation coupled with the feeling of impotence because there is hardly anything one can do to fight back against Spam bots. There is a constant bombardment via email for Viagra (and other derivatives like Vigara ; tools for the enlargement of certain particulars,University/college degrees that do not need attendance,free money vouchers,work from home secrets etc). This constant flow of unsolicited emails purporting to the life I live is getting beyond a joke . It is so intrusive and unwanted. However, it’s there. Every morning, afternoon, or night when one opens their email folder. The ‘Canadian Pharmacy’ offering all sorts of mixtures to cure all ills; the credit card company just gagging to give you a new card, or the Nigerian and or Hong Kong email informing you of the thousands of pounds/dollars in the bank that you somehow got bequeathed or forgot to claim. 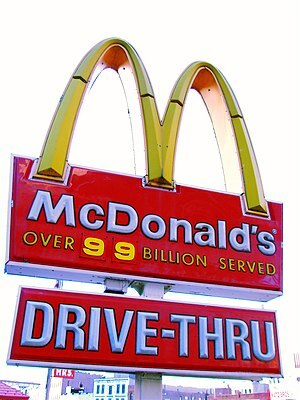 Only if. All these emails are known as electronic Spam. Why sully such a good name! No matter what barriers one builds, the spammers tirelessly continue to develop ever sophisticated methods to get over the barriers. The spam phenomenon is nothing new. Older generations grew up with junk mail and ‘chain letters’. Whatever happened to ‘chain letters?’ Apparently in the nascent days of the telegram, there were unsolicited mail too. Who would have thought. Imagine you are on a safari, or holidaying in a campsite and there are mosquitos constantly buzzing incessantly to bite you, grab your attention. And at times you end up giving yourself a big painful smack. Overtime these spammers send you mail, sometimes you avoid and delete, but on that odd occasion sometimes by sheer accident or curiosity you may click and open the mail. And that big and painful smack hits your computer senseless.You open a hornets nest. Of course it is naive to think spam can be stopped. Whats bewildering though is that the spamming of unsolicited mail actually produces positive outcomes. Malevolent lot they are. It defies logic, but, it does make one wonder what kind of world we live in.You read the papers, read blogs and its on radio and television yet people still fall prey to these con men/women. It does make you wonder though why and how do people still fall for these tricks. Bank account details are being revealed to strangers, money is being sent abroad to ‘prospective brides’, the con tricks are endless. Maybe it’s because the Devil works in mysterious ways. Another thing, one never gets spam telling you to go for your prayers or to read the Bible, for example. Or to do with any faith or religion. There is no moralistic spam either. One can only surmise that it is the work of the devil-people or spammers who are driven by avarice, greed and utter malevolence. In the bus, or train when commuting to and from work, I often look at fellow commuters’ faces mentally working out whether anyone of them could be a spammer. Sometimes I wonder what do they like? Could a photofit be drawn if someone where to lodge a criminal complaint against spammers? Whats their demographic profile, gender, ideological beliefs, or just beliefs in general? Apparently the majority of spam emanates from ‘Bots’. Bots are taking over our lives, they crawl around the world-wide web collecting our email addresses or any personal information. Its said about half the internet traffic is from these bots. Who are the men or women behind such mischief? Spam is abominable. It is disgusting and detestable . Not the tinned food.